Are you curious how you can make brown out of two common colors? Brown is a combination of three or more colors, so it can be made with a wide variety of colors, including colors that are already made out of two colors. For instance, green and red can be combined to make brown, and so can purple and yellow. You can combine yellow and purple to create brown with a tinge of red in it, and you can combine red and green to make brown as well. Since orange is a color made out of yellow and red, adding a little blue to it will make a shade of brown as well. You can also make brown by combining a lot of different colors together such as green, blue, red, and yellow. If you want to make a dark brown with black, you can combine black and bright orange. Pigments are substances that appear to have a color because the material absorbs specific wavelengths of light, reflecting back the other wavelengths of light. Many different materials and substances absorb wavelengths of light, however, pigments that have practical applications for humans need to possess high tinting strength, which means that only a small amount of the pigment is needed for the color to be seen. Practical pigments should also be stable at normal temperatures. Examples of practical pigments used by humans include paints and dyes. Pigments which fade, degrade, or are turned black over time (as they are exposed to light) are referred to as fugitive pigments. Pigments are typically insoluble or dry when in a liquid carrier, and they form a suspension when they are in liquid forms. 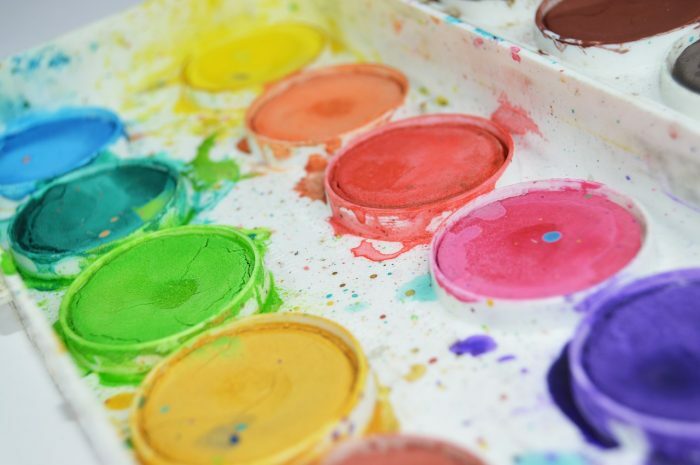 Humans have been using pigments for a long time, and early pigments were derived from natural sources like clay and other ground materials, or charcoal. Pigments like yellow ocher, red ocher, and carbon black could be readily derived from the natural environment around Paleolithic and Neolithic people, leading to their use in things like cave drawings. However, synthetic pigments can be traced back to approximately 2000 BCE, with a white pigment being made by combining vinegar and lead in an area with carbon dioxide. Egyptian civilization created a blue pigment derived from copper ore or malachite. Note that when it comes to biology, the term pigment has a slightly different meaning versus its common usage. In biology, pigments are color molecules located in a cell, and these molecules may or may not be soluble. This means that melanin, chlorophyll, and hemoglobin are biological pigments, even if they are soluble. Outside of these biological pigments, plant cells and animal cells can also have structural coloration. For instance, peacock feathers and butterfly wings have cells which join together in a certain structure that gives the feather or wing a coloration that can shift depending on the angle that the object is viewed from. By contrast, pigments have constant coloration. As previously mentioned, different wavelengths of light are absorbed by different pigments. When the molecule is hit by white light, the wavelengths of light can be absorbed in different ways. Some organic pigments use a conjugated system of double bonds to absorb the wavelengths. Meanwhile, inorganic pigments can use electron transfer to absorb wavelengths of light. As an example of electron transfer being used to absorbed light, the color vermilion is produced by a pigment that transfers electrons from one sulfur anion to a metal cation, such as Hg2+. Through the charge transfer process, most light is absorbed and only a few colors or wavelengths are reflected back. The visible spectrum affects how a certain pigment appears. For instance, a pigment may appear as a slightly different color under fluorescent lighting then it would underneath sunlight because the two light sources have different wavelengths of light. When a scientist notes the color of a pigment, the wavelengths of the lab light used to take a measurement must be recorded. The wavelengths of light used to take measurements are usually around 6500 K (D65), which is a roughly the color temperature of sunlight. The other properties of pigments such as saturation and hue are dependent upon the other compounds that are near it, or other compounds mixed in with the pigment. 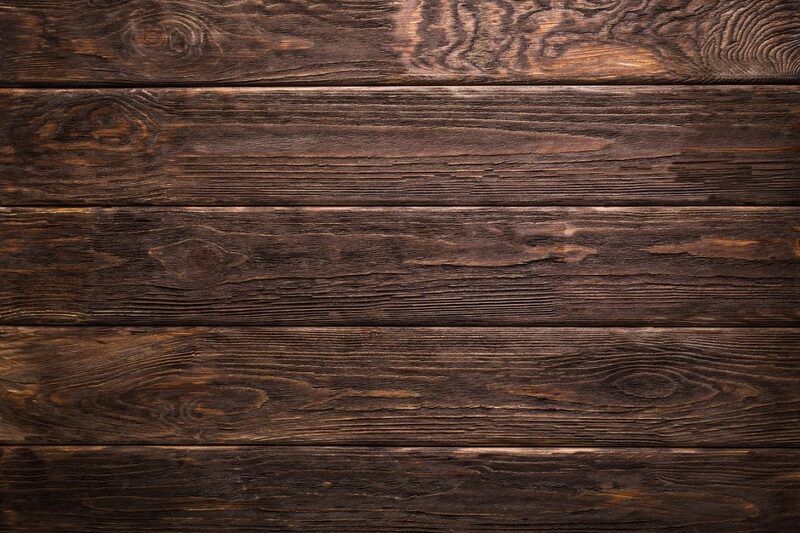 For instance, though the color of paint may look a certain way in a can when the paint is applied to a wall, the texture of the surface can end up affecting the appearance of the paint. The stability and toxicity of a pigment are also impacted by the chemicals that surround the pigment suspension. Electromagnetic radiation exists throughout the entire universe and it comes in many different forms. Electromagnetic radiation can manifest itself as radio waves, infrared radiation, microwaves, ultraviolet radiation, and visible light. What humans call visible light is simply the wavelengths of the electromagnetic radiation spectrum or EM spectrum which can be sensed by the human eyes. Electromagnetic radiation moves in waves or particles, and it can exist at different frequencies or wavelengths. The different wavelengths of radiation that the electromagnetic spectrum can exist in are typically divided into seven different sections. 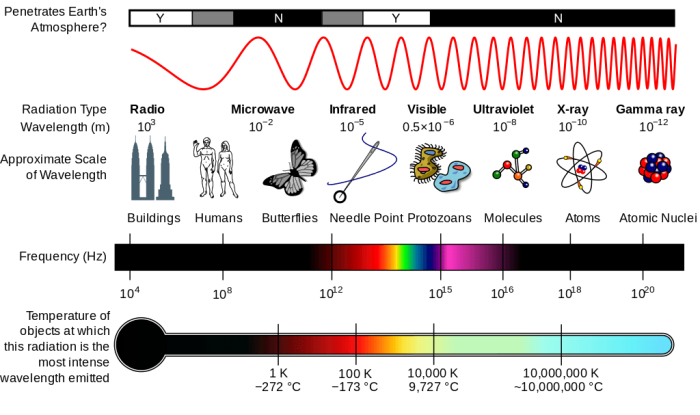 These sections of the EM spectrum are listed by decreasing wavelength and increasing energy frequency: radio waves, microwaves, infrared, visible light, ultraviolet, x-rays, and gamma rays. The wavelengths of light the human eye is capable of perceiving fall in between ultraviolet wavelengths and infrared wavelengths on the electromagnetic spectrum. Visible light frequency is somewhere 740 NM and 380 NM when the frequency is expressed in hertz, though it can also be defined in cycles per second, in which case the frequency of visible light is between 4×10^14 to 8 x 10^14 cycles every second. The temperature of an object and its color are correlated with one another. Hotter objects possess more energy, and the energy that radiates off the object is typically made out of shorter wavelengths rather than longer wavelengths. As a result, as objects grow hotter the human eye perceives this as the changing of colors. One example is how a blowtorch changes in color as it becomes hotter. When first ignited, the flame of a blowtorch is a red color, yet as the flame is adjusted and becomes hotter the flame turns bluish. The process of converting heat into light energy is called incandescence. Within the human eye, there are a number of cells that specialize in the reception of light. 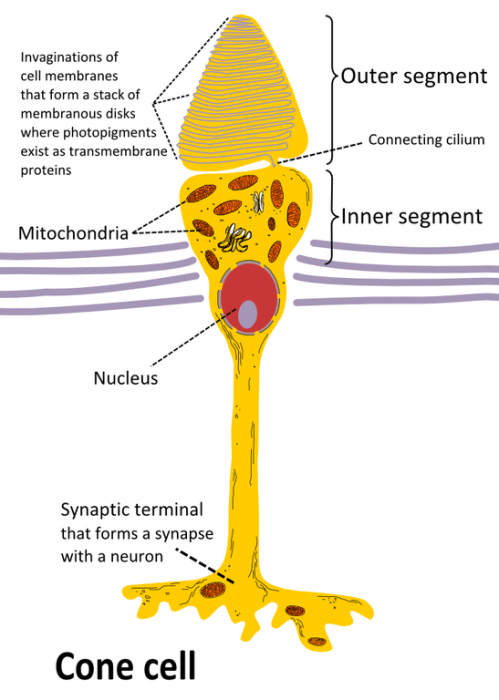 These cells are referred to as rods and cones. Rods are the eye cells responsible for vision in lowlight conditions, taking in the visible light in the area. By contrast, cone cells operate in conditions where there is plenty of light and where the color of an object can be perceived. The cones of the eye deal with the wavelengths of the EM spectrum that correspond to certain colors. Wavelengths of light around 740 NM, the wavelengths at the lower end of the visible spectrum, are perceived as red, while the color green is perceived by intercepting the light in the middle portion of the visible spectrum. Finally, the wavelengths of light that are around 380 NM are found at the upper end of the visible spectrum, and these colors are for interpreted as violet. All other colors that the eye can perceive are simply comprised of these three different colors mixed together. As an example, the color magenta is made out of red and blue combined, while cyan is a mixture of green and blue. Meanwhile, the color yellow is made out of red light and green light. White light is the product of all three of the colors being mixed together, and black is the absence of light. Incandescence happens because hot material emits photons, and this emission of photons is part of the thermal vibration energy of the material. Hot objects release energy in the infrared portion of the electromagnetic spectrum at around 1470°F or 800°C. If the temperature of an object increases further, the energy released by the object will ascend into the visible portion of the electromagnetic spectrum, and when this happens the object will appear to glow a bright red color. If the temperature of the object continues to increase beyond this point, and if the temperature increases further still it will begin to turn blue. Previous Post« Previous How Many Weeks Are In A Year?